Disneyland. When you hear the name, it invokes images of excitement in the eyes of children the world over. However, the reality of navigating the theme parks can be a much different experience. That’s one of the main reasons I wrote The Great Disneyland Scavenger Hunt! 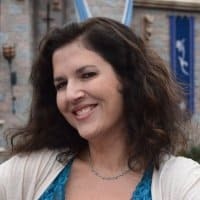 As an annual pass holder for over twenty-five years, I have become a keen witness to the adventure parents have with their children throughout the parks and have found several universal truths on how to keep the little people happy on your vacation to the Disneyland resort. First and foremost, the kind of snacks you bring to the theme parks will keep your kids going or stop them in their tracks. Over the years, Disneyland resort has implemented healthy options instead of the barrage of sugary snacks we saw in previous years. Keep the kids focused and happy with plenty of fruit and vegetables offered throughout the parks. Nuts, dried fruits, and fruit juice are also offered as healthy replacements for soda pop, candy and ice cream. While the sweets are great for an after meal treat, these are not a good option first thing in the morning. Unfortunately, I have observed kids walking down the main street of Disneyland with a bag of cotton candy at 8 o’clock in the morning. These are the same children melting down by 9 o’clock in the morning and can’t stand still in the queues lines the attractions for more than a few minutes at a time. 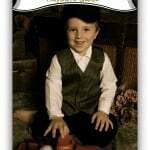 Above all, with the summer months coming, keep your kids hydrated. This will keep them focused and energetic during the warm weather. No one wants to stop the fun for a trip to first aid land. While you are allowed to bring your own water bottle into the theme parks, you can request cold water at any of the restaurants or walk up food venues throughout Disneyland resort. On Gadget’s Go Coaster – As you begin your approach to Gadget’s house, what every-day item is used for the rain gutters on the outside of the house? On Haunted Mansion – As you walk past the pet cemetery, how many bird monuments do you see surrounding the cat monument? On Monster’s Inc. – As you enter the queue for Monsters Inc. Mike and Sulley to the Rescue, you will notice a menu from Harry Hausens on the wall. What is in the Terrible Teriyucki? You will be surprised how quickly the time will go by while you are waiting for your favorite attractions. Another option for keeping the kids occupied is to divide and conquer while shopping especially at the end of your day. Take some time to show the kids the fun extras on Main Street U.S.A. while the other parent or caregiver is standing in line for souvenirs. What is the name of the gypsy fortune teller that sits at the entrance to Penny Arcade? Did you know the antique nickelodeon at the back of Candy Palace plays classic Disney songs every seven minutes? Stay for a while to hear your favorite songs and marvel at the engineering wonder before you. As you enter the toy section on your right, you will see classic characters lining the walls above you; what playground attraction do Robin Hood and Maid Marian sit upon? Disneyland resort offers options for families with every need. Take advantage of the baby center for privacy to rest so they do not get over tired. Disneyland also allows for families of special needs kids to use their guest assistance system offering return times for attractions with longer lines. For Make a Wish families, Disneyland offers a private suite for kids to take a nap during their trip, among other amenities. Be sure to call ahead and speak with Disneyland public affairs to alert the Disneyland Team of any special assistance you might need. These are just a few of the options to help you get the most out of your vacation to Disneyland. 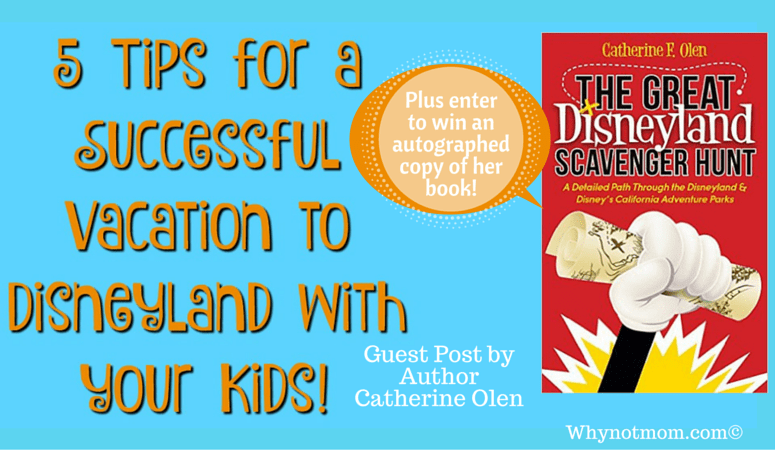 How would you like to WIN an AUTOGRAPHED copy of Catherine Oler’s book The Great Disneyland Scavenger Hunt? 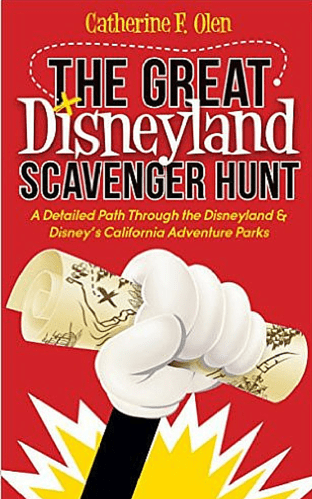 Enter to Win an Autographed Copy of The Great Disneyland Scavenger Hunt by Catherine Oler! Read more about the author in her bio below! Top Disney Park Tips from YouTube! This is great stuff! Congrats on publishing your book. I know so many long-time passholders, our paths have probably crossed – or nearly, at least. Cheers and best of luck with the book! P.S. I couldn’t get the CommentLuv to work. The set expectations tip was the most helpful for me. I liked the tip about the antique nickelodeon playing every 7 minutes. Great for a nice break while shopping or during a day of play! I think Tip #3 is a good one: Set the expectation that you and your children will be spending quite a bit of time standing in line for the attractions. I like the fact that you can get cold water at the food venues. That is nice on a hot day at an amusement park.